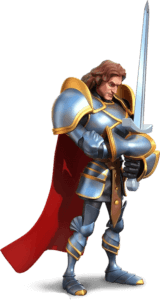 Sir Lancelot du Lac (meaning Lancelot of the Lake), alternatively also written as Launcelot and other spellings, is one of the Knights of the Round Table in the Authurian legend. He typically features as King Arthur’s greatest companion, the lord of Joyous Gard and the greatest swordsman and jouster of the age-until his adulterous affair with Queen Guinevere is discovered, causing a civil war exploited by Mordred which brings the end of Arthur’s kingdom. 2% / 4% / 7% / 10% / 15%.